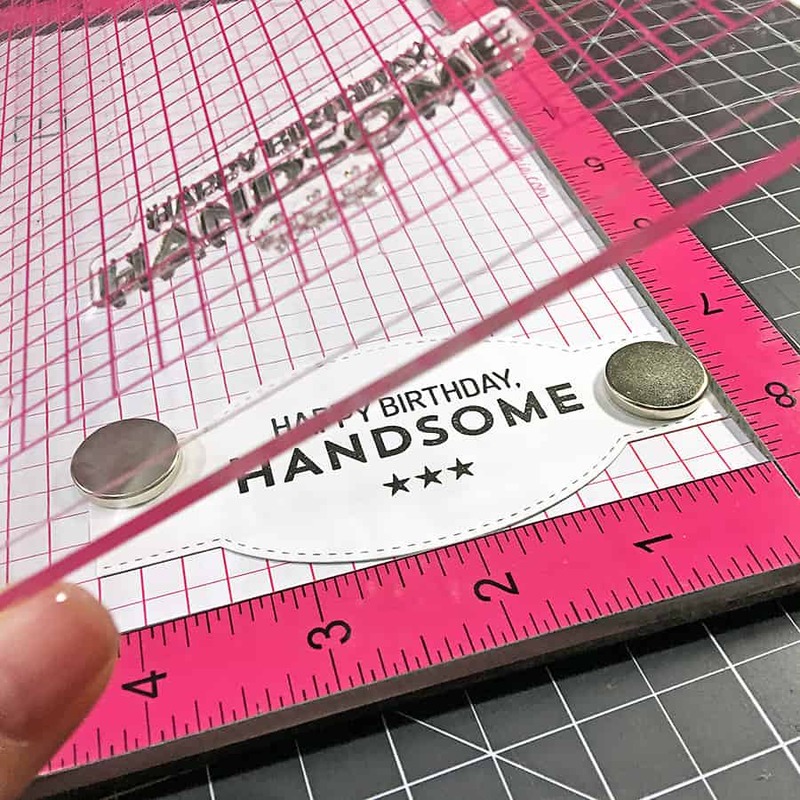 Do you find creating a masculine birthday card to be a challenge? I’m a die hard fan of flowers so when it comes to making a card for my man, I’m way out of my comfort zone. It’s not difficult, though, if you don’t overthink it. Earthy textures like wood, metal, and stone all do well on a guy’s card – as do earth tone colors. Keeping the design simple and adding a little something special to personalize the card is the key to a good masculine design. 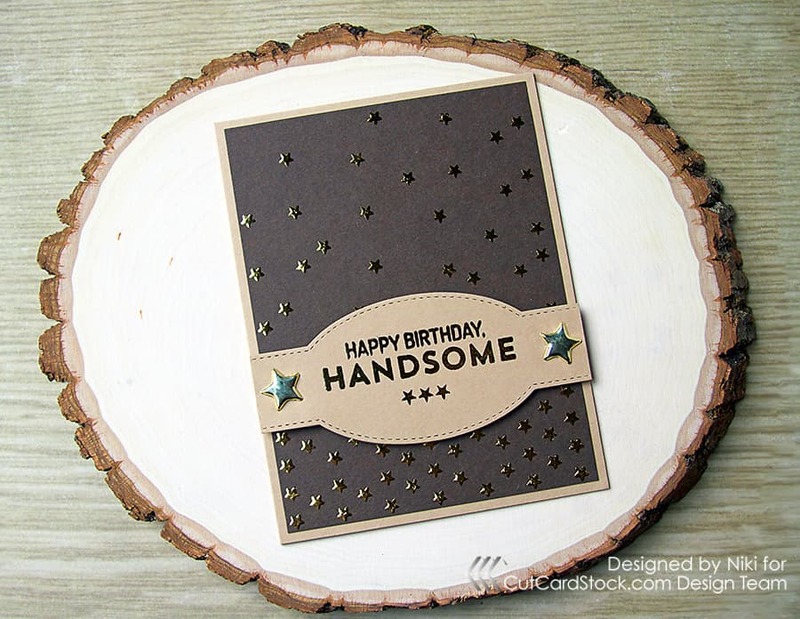 The card I made today is for my husband’s birthday (full disclosure, his birthday is in December but I love this stamp set and I don’t have the jam to refer to an acquaintance as “handsome” :D). It requires a few extra materials than my last few posts on the blog – but believe me, the shiny finish is worth it! Let’s get all the pieces together first. Cut a 4 x 5.25-inch piece of the Brown cardstock. Next, grab the Light brown cardstock and cut a 4.25 x 5.5-inch rectangle, an A2-sized (4.25 x 5.5-inch) card base, and also cut the strip for the sentiment with the die from My Favorite Things. 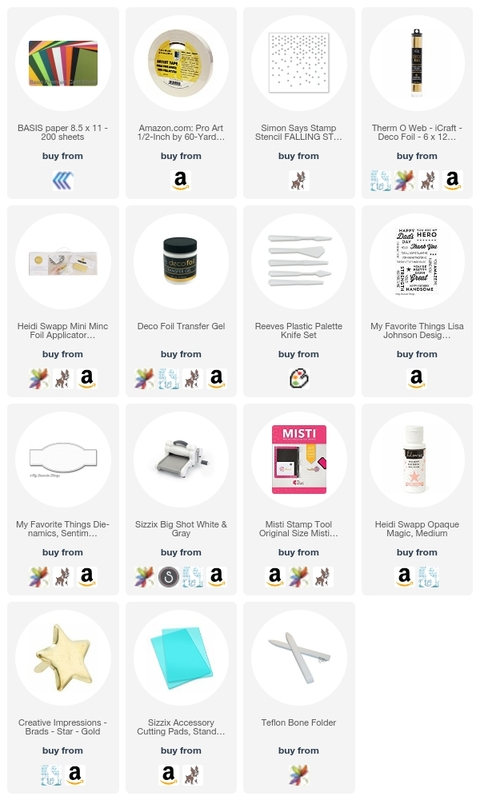 Set all that aside except for the Brown rectangle. We’re gonna break out the stencil and get a little messy, so find you a sheet of scratch paper or an old clipboard to work on. Begin by taping down all four sides of the Brown rectangle onto your surface. Then, center the stencil however you like over the cardstock, but this time, only tape down the top and bottom. 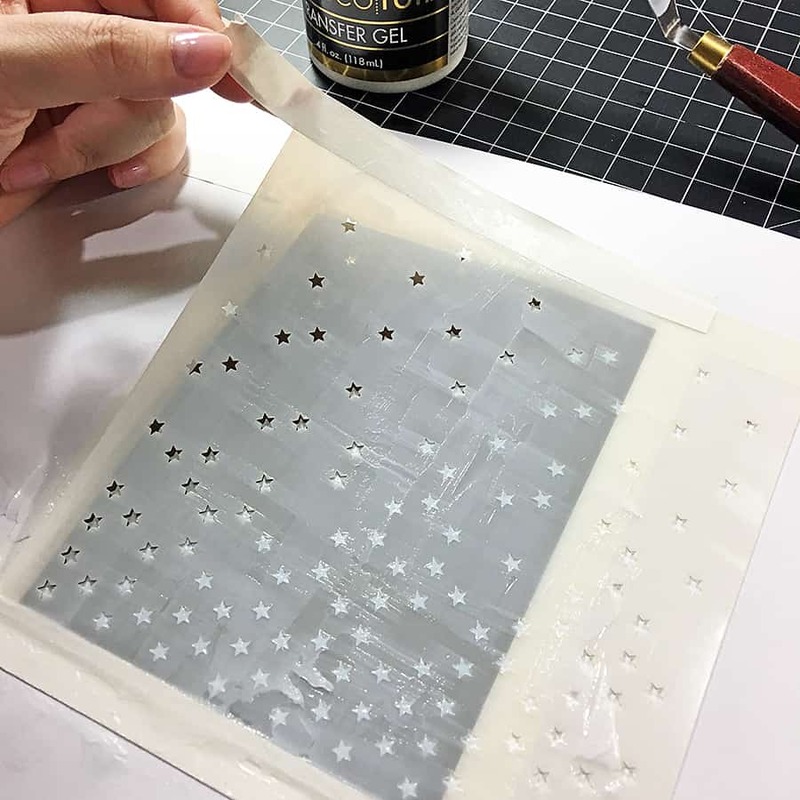 Open up the Transfer Gel and skim it as evenly as you can over the stencil without pressing the gel too hard into openings. Carefully scrape off the excess back into the jar. 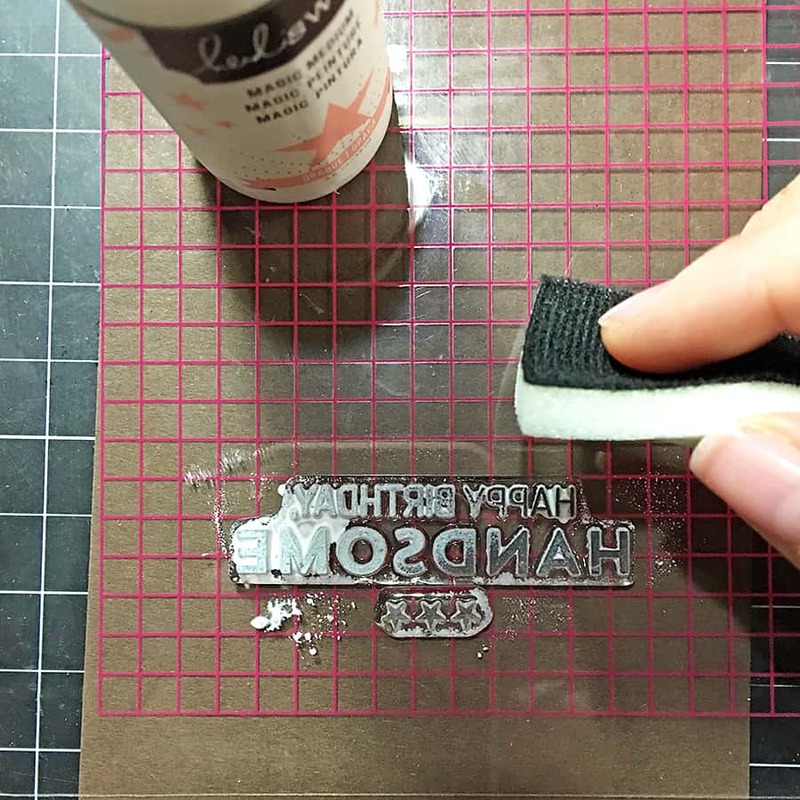 Here’s the fun part: gently peel off either the top or bottom tape strip and lift the stencil slowly, like it’s on a hinge. Once you have it lifted you can remove the stencil completely. I love Basis cardstock for this technique; the texture of the paper helps keep the gel (or pastes) from getting in places it’s not supposed to be. It’s a huge difference from smooth papers, which the mediums tend to seep underneath. Oh, don’t forget to clean up ASAP! 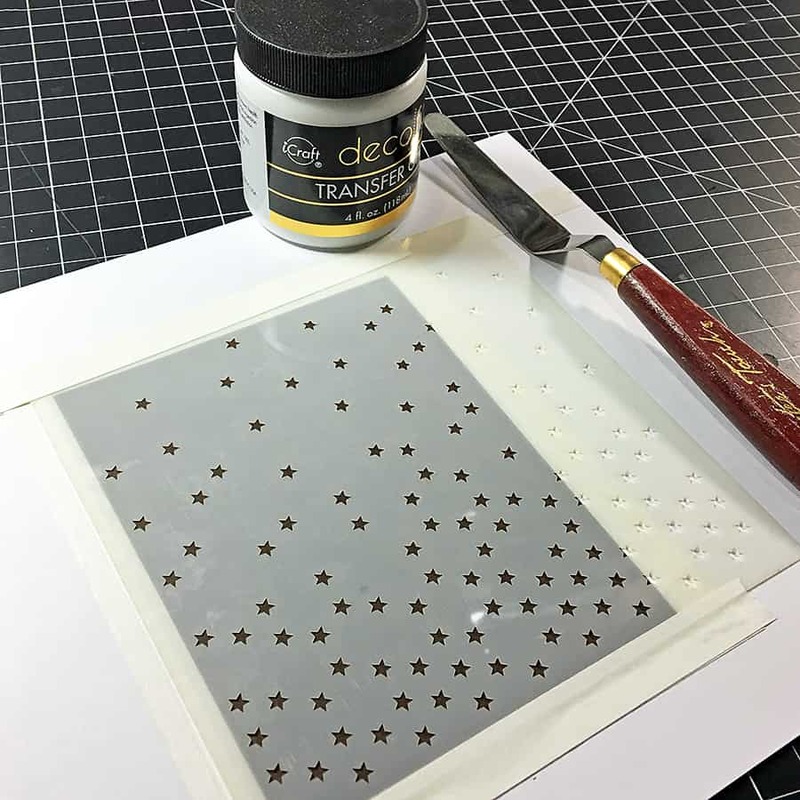 You don’t want this stuff drying on your stencil or palette knife – it is super hard to get off once it reaches that point. While you’re doing that, the stars will be drying from a white color to clear. 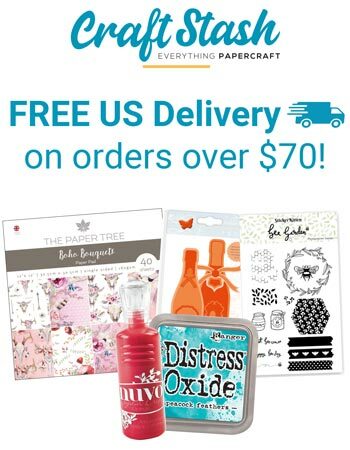 When it’s all dry, pop a sheet of transfer foil over the paper, tuck inside a carrier sheet (or folded parchment paper!) and run through your laminator. Here’s a before from when I first lifted the stencil and after I ran it through with the foil. 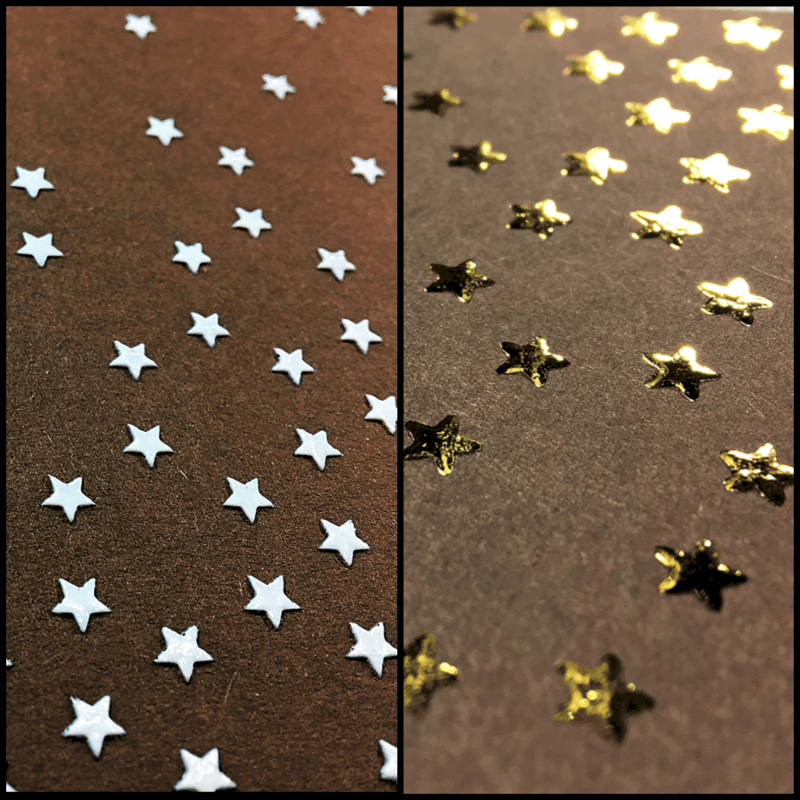 The gel gives the stars a really cool rounded embossed look. Next up is the sentiment. I wanted it to match the foil look of the background, so I used a MISTI and Opaque Magic Medium as the “ink” for my stamp. You’ll want to line up your stamp and sentiment strip in the MISTI before using this product. It’s like a glue and dries very quickly. 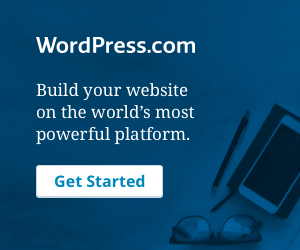 Since it is very sticky, you’ll also want to stamp it several times for good coverage. See that big glob there on the M and E? That’s too much, don’t do that. Ha! 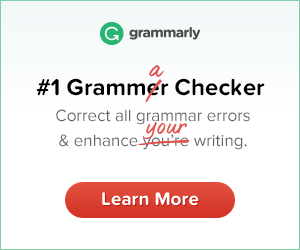 The D, S, and O have the right amount on them. Dab and stamp three to four times on your paper. Remember to clean your stamp as soon as you’re finished with it. A toothbrush works wonders to get the tiny corners! The sentiment will need just a few minutes to dry. It was hard to get a good photo of the coverage with the Magic Medium, so here’s the black and white version I used for testing. Notice how “handsome” isn’t a solid black? That’s ok, the foil will still cover it just fine. When the sentiment is dry to the touch, cover it with transfer foil and a carrier sheet and send it through the laminator. Time to put everything together! 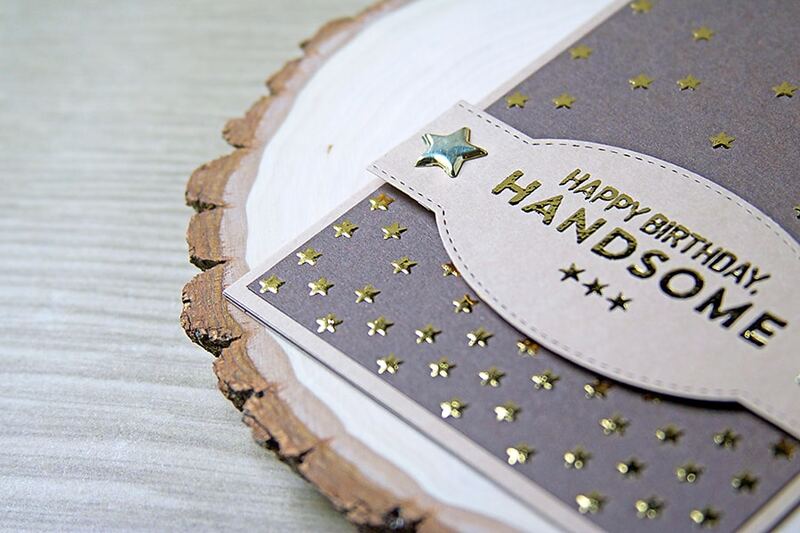 Grab your card base and adhere the starry panel with glue tape as shown below. Use a pin to poke holes where the brads will go on either side of the sentiment and attach them. Don’t be afraid to twist the brads a little so the back bits aren’t visible. Adhere the sentiment strip about 1.5 inches from the bottom with foam adhesive. All done! 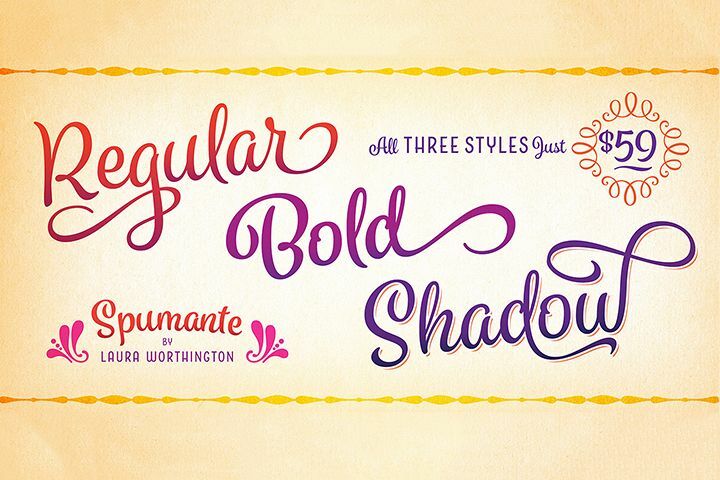 Stencils can be a little messy, but they are so much fun – especially when paired with a good cardstock like Basis. Do you work with transfer foils often? 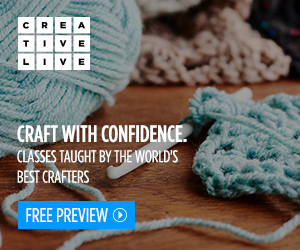 Leave a comment below and tell me what like of things you like to make! Don’t forget to pin this masculine birthday card to Pinterest for later!